WHEN A COLD-BLOODED KILLER HAS HIS SIGHTS TRAINED ON YOU, IT’S PROBABLY A GOOD TIME TO START WEIGHING YOUR OPTIONS. Or, if you’re Arianna Jackson, you can deal with the problem head on and give him a dose of his own medicine. Challenges arise, however, when AJ has to contend with a friend who has gone missing after being accused of a brutal murder, as well as the arrival of an unexpected visitor who claims he’s only got the best of intentions. Things quickly become as clear as mud when she’s not sure who to trust and risks losing more than her moral compass when it comes to deciphering the truth from the lies—it could mean the lives of those she cares about, if not her own. Despite obstacles being thrown in her path at every turn, AJ—with the help of her best friend, Leah Campbell and Alaskan Malamute, Nicoh—vows to tackle every challenge as it comes, whatever the outcome. What else can you do, after all, when your life’s been built on a foundation of lies and the only truth you know just came crumbling down? When all is said and done, decisions will be made, lines drawn—while others are crossed—and for some it will be the end of the road. 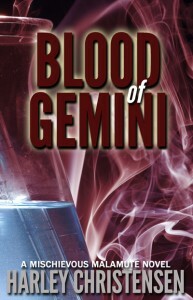 Blood of Gemini is a continuation of the series and touches on a few of the plot lines dangled out there in Gemini Rising.